For anyone who isn’t familiar with the service, it is often described as a “Netflix for magazines.” Well, maybe the old DVD rental and basic movie streaming Netflix, before all the content deals and original shows. 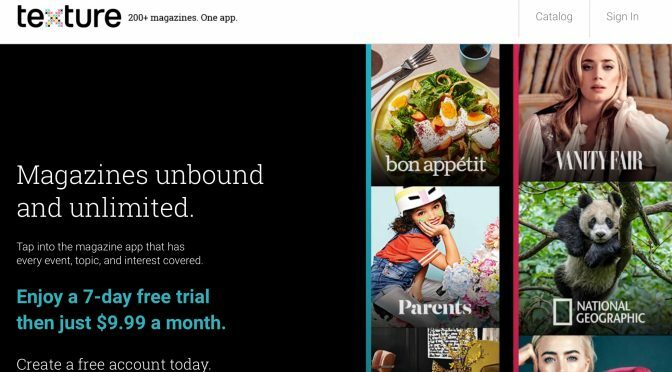 Anyway, for a single fee, users get access to a wide variety of magazine content on their devices, on demand. Currently, Texture works via an iOS or Android app, or via a web browser, so it is easy to access from most current mobile devices. Subscribers are able to download content to their devices for offline reading, making Texture perfect for use during long drives or flights. Rather than having to pick and choose a small number of magazines to subscribe to yearly, or purchase individual issues for the higher prices they go for, Texture lets you change things up as your schedule or interests change. The service currently boasts a catalog of over 200 choices, including National Geographic, Bon Appetit, Esquire, Forbes, People, Entertainment Weekly, ESPN The Magazine, Sports Illustrated, Popular Science and Mechanics, and even good old Macworld. Texture also includes back issues of most magazines, which makes it quite flexible when delving into topics that you are interested in. This isn’t the first time Apple has staked a claim in the digital content space. They tried to make a big push into magazines and books in the early days of the iPad. 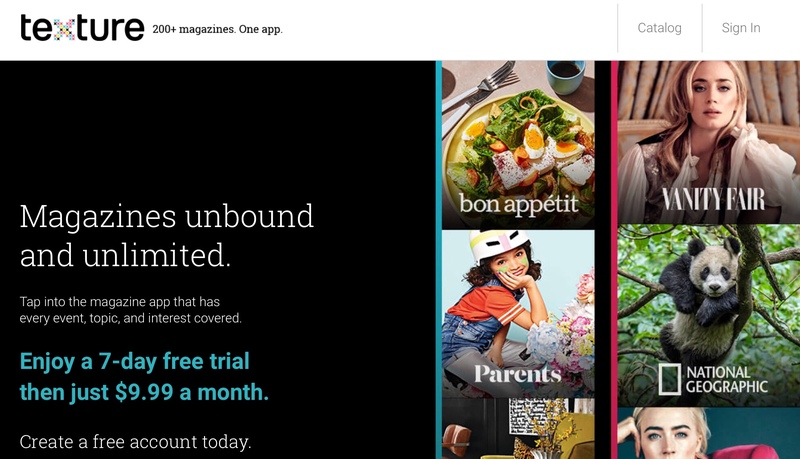 They actually gained a lot of traction in the magazine space initially, and offered publishers a great set of tools for the time to create digital magazines that couldn’t exist in print. Unfortunately, they gave the print business WAYYYYY too much credit, as all most were interested in was churning out clunky, poorly formatted PDF versions of their print content. Eventually, consumers grew bored with the lack of innovation and quality and moved on. There are still apps from publishers in the App Store that allow access to their content, but Apple shuttered its old unified Newsstand section in iOS a few years ago. With all that Apple has been able to accomplish with Apple News, acquiring Texture seems like a smart move to me. While Apple News got off to a rough start in year one, Apple quickly improved it and it is now a strong point for them. I have no problem saying that our own readership numbers for new content on Apple News are higher than direct hits on the site, and are usually higher than Flipboard, as well. It was not hard to get set up to become a content provider, and I have been very impressed with how easy it is to use, as well. It even comes with several methods that publishers can use to monetize, including handling their own ads, or letting Apple do it for them. So adding Texture feels like a logical next step for Apple with Apple News. Adding Texture to this mix automatically fills in any blanks in Apple’s News service’s content. It also suddenly brings Apple a new regular subscriber base. What they plan to do with that user base right now isn’t clear. They could continue the service as it stands, but I personally think that is unlikely. I think it is far more likely that they will integrate Texture with other content offerings to bring even more value to their growing Services business. First you had iCloud, which has continued to grow and improve over the years. Then it was Apple Music, which Cue let us know is now up to 38 million paid subscribers. We know Apple is getting ready to go far beyond Planet of the Apps and Carpool Karaoke to create what looks like it will be a legitimate video content service. And now we have Texture, with its robust offering of current periodicals available for a single monthly price. Today, Eddy Cue said that Apple is “all in” on entertainment, and that definitely seems to be the case. We have no clue how Texture will work under Apple. Will it continue to be available for other platforms? Will it exist alone, or will it be bundled together with one of Apple’s other services? If so, which one? We know that it should be a perfect fit for the iPhone, and even more so for the iPad. How about the Apple TV or the HomePod? I could absolutely see Apple using Texture to feed magazine content to HomePod, to be read to Apple users by Siri. It will definitely be interesting to track what Apple does to leverage their new acquisition going forward. What do you think about this Apple purchase? Are you interested in having access to 200+ magazines? Would you pay a little more on top of your iCloud or Apple Music subscription fees to get it? Let me know what you think in the Comments section below, on Flipboard, on our Facebook page, or on Twitter @iPadInsightBlog.